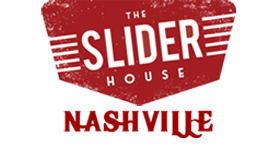 Welcome to The Slider House-Nashville. Since opening in 2013, we have been creating sliders so flavorful they will blow your mind. In a world of giant restaurants with giant burgers, we believe the art of making sliders has been lost. Our mission is to reinvent the slider and set a new standard. If you thought they were just about beef – think again. You can expect creative, hand-crafted flavor, sourcing as many local inspirations and ingredients as possible. We offer beef, chicken, pork, fish, and even a veggie slider that will make a vegetarian blush! We partner with local craft beer and drink suppliers in Nashville and our huge selection of craft beers offers over 30 Tennessee beers along with 100s of other great choices. The patio is pet friendly so bring your four-legged friends with you as well to hang out with us. PET FRIENDLY PATIO - OVER 30 TENNESSEE BEERS - 100s of BEER CHOICES - FREE KOOZIE WITH PURCHASE - LIVE MUSIC & TRIVIA - ORDER DELIVERY ONLINE - CATERING INCLUDING ON-SITE COOKING! I LOVED IT. The food was super good, sauces were pretty good, the service was good and all the workers were super friendly! The building itself and atmosphere was super cool as well. "Best sliders and food in Nashville!! The Nashvilly was delicious!!!" The Slider House is close to a studio I frequent, so it's a good choice for a quick lunch. I've enjoyed all the sandwiches I've tried there, but I think my favorite thing there are thier dry-rub wings! Again, the sliders are fantastic, but those WINGS! Some of the best I've ever had. Looking forward to going back. 8 Jumbo wings tossed in your choice of house made sauce, Bloody Mary, Sriracha Honey, Buffalo or Dry Rub. Signature blend of melted cheeses made with domestic and craft beers. Served with a generous portion of our house made chips. A blend of cream cheese, mozzarella, ranch, shredded chicken and house made buffalo sauce. Served with a generous portion of our house made chips. Fried jalapeño coins and onion petals served with a side of cajun ranch for extra kick. Our pickle chips are hand battered, fried golden brown and served with a side of creamy ranch dipping sauce. A combination of sweet potato fries, parmesan fries & house chips. Served with 3 dipping sauces: beer cheese, horny sauce, smoked tomato remoulade. Hand-breaded fried green tomatoes with dressed greens & shredded parmesan. Served with smoked tomato remoulade. House style chips topped with corn salsa, cheddar cheese, jalapeños, “Champagne of Beers” beer cheese, lettuce & your choice of meat (ground beef, chicken, pulled pork) Served with sour cream and fresh avocado. Fried chicken tossed in sriracha honey glaze with chopped bacon, bleu cheese crumbles, grape tomato, bacon, egg, avocado & leaf lettuce. Served with your choice of dressing.